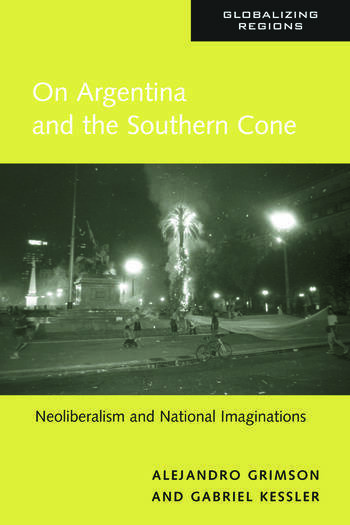 This book considers how globalization is impacting contemporary Argentina-via regional trading blocs, through migrations across its borders, and through the emerging transnational border regions that it shares with other Latin American nations. Overshadowing all of these trends is the current crisis brought on by both international financial institutions possessing an increasing say over how the country is run and internal elites trying to use Argentina's integration into the world financial system to their own advantage. Argentina has long imagined itself as a European nation, qualitatively different from its Latin American neighbors. But recent events are forcing it to change its perception of itself. As the size of Argentina's transnational community continues to swell, and as the nation continues its financial and social implosion, Argentinians are being forced to re-imagine the nation as being Latin American, replete with the histories and problems of that part of the world. Alejandro Grimson is a professor of social and cultural anthropology at the university of Buenos Aires. He is quite young, but has written three books in Spanish, edited one, and co-authored another. "To view Argentina as a Europeanized country in steady decline defies rational explanation. It is neither an exception in Latin America, nor a middle class nation without interethnic conflicts. On Argentina and the Southern Cone moves beyond these common misconceptions by applying a variety of ethnographic perspectives to this multicultural society, which is much more than the sum total of its capital city, Buenos Aires. Utilizing a wealth of solid historical, economic, political and cultural information, the authors have not hesitated to deconstruct commonly held self-serving narratives. Grimson and Kessler have succeeded in placing the everyday reality of a heterogeneous and contradictory country in a regional and international context through which the concept of nation, the needs of the state and neoliberal decomposition appear in a new light."